A spine that curves to one side. A Degenerative disease such as osteoarthritis- when the vertebrae and/or discs on one side of the spine weaken or degenerate more than those on the other side, creating a curve. Idiopathic Scoliosis that went unnoticed and untreated during adolescence- a curvature that went unnoticed during adolescence now becomes noticeable in adulthood because it has continued to progress or because it begins to cause pain. Scoliosis that was treated with surgery during adolescence- individuals who undergo scoliosis surgery as teens continue to struggle with the symptoms of scoliosis throughout their lives. How is Adult Scoliosis Treated? Traditional medicine generally employs pain relievers and anti-inflammatories to alleviate the painful symptoms of adult scoliosis. The problem with these drugs is that they only last a few hours, they have many side effects and don’t resolve the underlying problem. At South Florida Scoliosis Center we offer a safe and natural alternative to alleviating the pain and symptoms of adult scoliosis. If your adult scoliosis stems from a degenerative condition, vertebrae and discs can be out of alignment and compressing nerves, which can cause your scoliosis pain. If the scoliosis has been present for many years, whether treated with surgery or not, there’s a good chance that compensatory muscles have become strained. And with the scoliosis curvature existing for years, the unnatural position can cause other misalignments and further interfere with proper nerve function. Our scoliosis treatment methods can begin correcting structural misalignments and restoring optimal function to the nervous system. 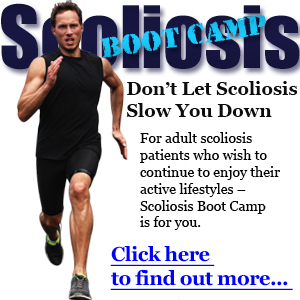 If you’ve never considered chiropractic for your adult scoliosis, now is the time to contact us. At South Florida Scoliosis Center we will go to great lengths to understand your particular situation, by performing an extensive exam. Discuss all findings, and design a customized plan for working with your adult scoliosis. I’m impressed with Doctor Greaux and his experience with Scoliosis. Most Chiropractors are passionate about health and well being, but to get the CLEAR training to treat and educate his patients is an honest dedication to natural health. I’m so happy and grateful we found him!